Edit 31.7.2016 - There was still one crucial error on the layout, which made the board defunct. Fixed and tweaked a few things around to accomodate the polarity protection etc. *Should* finally be safe to build. For many years I had a TS10 Metal Charger which had an extra EDGE knob. It was a good pedal with the cut diode pairs. Gotta love the out of tune guitar in the video..
what is the best substitute the 2n5088? 2N3904, 2N5089, 2N2222, BC549, BC550 and so on. Any NPN Si transistor will do. What it is won't really matter as those are just in and out buffers. There must be something else wrong in there. 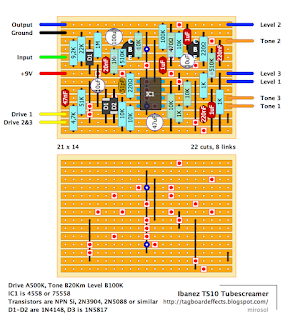 Those transistors are only buffers and they should not have any effect on the sound. Check for solder bridges, suspicious looking joints and reflow them. first of all, thank you man! you've done an incredible job here! second.. this TS10 is driving me crazy! I just can't get throught it!!! I'm having trouble with this build as well. I've knifed the gaps and reflowed the solder a couple of times and nothing. I'm still not getting any signal what so ever. I'm able to trace the signal all the way to the 1uF cap, 510K resistor, and the B leg of the transistor in the upper right corner of the board but can't seem to figure it out from there. Maybe that's why this circuit is still unverified? Any help would be greatly appreciated. Layout updated. It should be safe to build now. I just did a new copy of the board image, so it has to be 1:1 now. Hi can you let me know if anyone has managed to build this successfully yet? I am having issues with zero output. 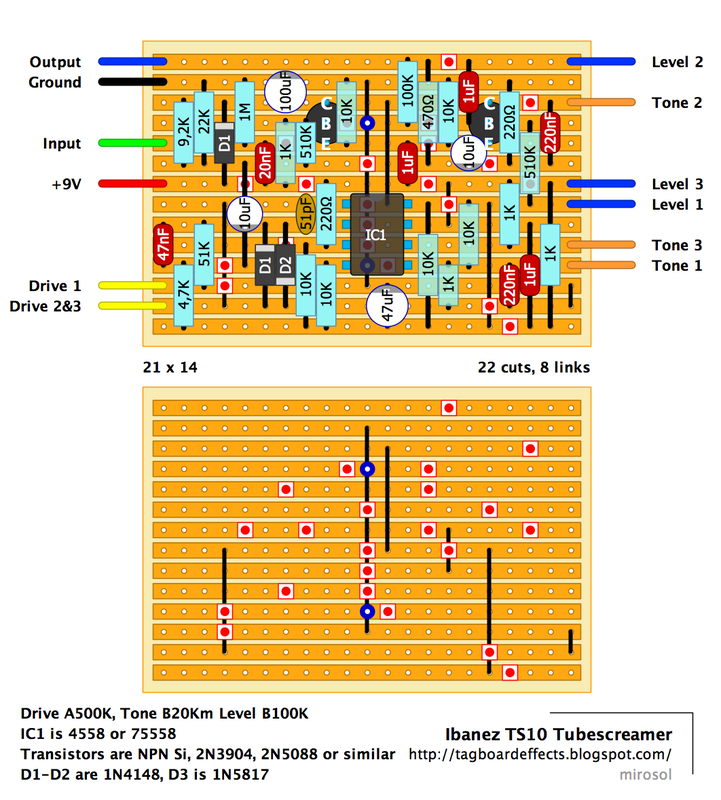 Based on GGG's mods, all we have to do is build a TS808 but replace three parts to make it a TS10. Anybody build this? Is it verified? I didn´t have exact pot values, but build this anyway, at least got sound and I think it sounded as expected, need to wait for the correct pots though until I can call it verified. It would be really great if you can check it. Take the upper lead of the 10K mentioned and desolder it. Take it two holes to the right. That should do it. For the current, fixed layout, there are a few more tweaks, so the files do not look alike. OK, superb! Will do that and report next week. Finished two of these in an wooden engrain white-oak enclosure, had to order two 20k w-taper pots for tone; without them the tone only works on the first 5% and last 5% of the pot (dissapointing). Would love to post pics of my builds; but don't know how or where. This layout mentions diode 3; but i don't see a diode 3 on the perfboard? Am I right in assuming the first D1 is actually D3, since it's not paired for clipping?? ?